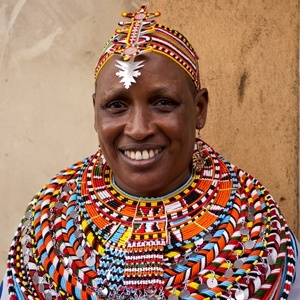 Rebecca Lolosoli born in the Samburu district in 1962, is best known for her work in empowering Samburu women. She was unable to complete her studies due to lack of school fees and she got married instead. Her heart to help women and girls who were abused led to her being beaten by men from the village. When she noticed that her husband didn’t oppose her actions nor those from the men who beat her, she decided to leave him. She formed the Umoja women’s group that aimed at creating a livelihood for the women and girls who had been abused and/or marginalised within the community. They started manyatta dukas where they sold maize flour and sugar but that didn’t kick of well and it eventually died. Not deterred they started on jewellery, which caught the eye of Kenya Wildlife Services (KWS) who took them for further training to improve their products for the tourists. Years later, the group has grown to have their own village where men are only allowed in if they agree to follow the rules set by the women, failure to which they are kicked out. Rebecca and her group have gone on to win several awards for their amazing work. Rebecca wrote a book, Half the Sky which was translated to German “Mama Mutig” which she’ll be promoting during her tour in Germany.